Ah Bernadette! You have got to love her in spite of all of her faults. She’s witty, intelligent, and an immensely creative architect. Unfortunately, something has happened to her, making her anti-social and borderline argoraphobic. This is a novel that explores what can go wrong with someone and how that person is perceived by others. It also speaks of personal limits. The reader can’t help but love Bernadette Fox because her rants are sometimes the ones we want to do ourselves, but prefer to do it in our heads. Not doing her job as an architect for a long while, she tries to cope with being stuck at home because she hates going out, while trying to raise her intelligent precocious daughter Bee. Meanwhile her husband, Elgin, is a big computer guru working for the omnipresent Microsoft or MS as the people call it in the book. He is the reason they have moved to Seattle. The book is an amazing introspection on what is wrong in American society. Maria Semple has found an ingenious way of critiquing that through the usage of the different types of correspondence used to tell the story of what happens to Bernadette. The most original aspect of this book is that it is told from multiple perspectives, using letters, emails, faxes, doctors reports, and interviews. Some may argue that it isn’t literary enough because of that but I disagree. What better way to critique society while using one of its devil evils, emailing, etc. It’s clear that Semple has taken a lot of care into weaving the story. There are many issues that are developed such as husband/wife relationships, mother/daughter relationships, being wealthy, creating, socializing, integrating into a community, etc. What I love the most is that it got me to laugh out loud quite a few times. It is an entertaining and gratifying read. It really made me wonder how I would react to some of the things that happened to Bernadette. At one moment, there is a reference to a novel with a famous architect in it and Bernadette’s creativity rivals his ingenuity. The only thing is Bernadette is human and that fragility is what makes the reader empathise with her. 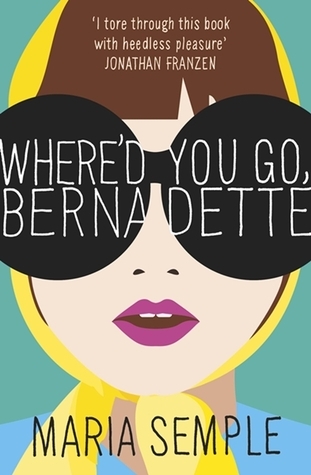 Where’d You Go, Bernadette is not Maria Semple’s first novel. It was The One is Mine. It is the story of a profoundly unhappy woman named Violet Parry, who is living a luxurious life with her husband David and her toddler Dot. It’s not until she meets Teddy that things seem to be very different for her. Semple wrote on various popular television series where she’s proved she knows how to tell a story. She is credited for having worked on shows such as Saturday Night Live, Arrested Development, Suddenly Susan Mad About You, 90210, and Ellen. Writing might be in her blood as they say since her father Lorenzo Semple, Jr. worked on the television series of Batman. Maria Semple lives in Seattle with her husband and her daughter Poppy. Check out the link below where Semple talks about how she went about writing Where’d You Go, Bernadette and mentions a few excellent pointers for debutant writers.